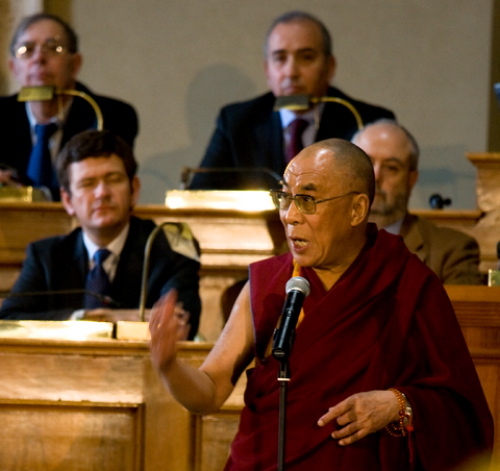 The Dalai Lama during a previous visit in Italy, on February 9, 2009, for receiving the honorary citizenship of the City of Rome (© Marco Manieri | Dreamstime.com). Rome, Nov 19 (IANS/AKI) — “It is of fundamental importance to maintain your own traditions, and Italy has a Christian and Catholic background. Therefore, to keep the tradition of the crucifix in the schools is extremely important,” the Dalai Lama told a media conference at Italy’s chamber of deputies Wednesday. The European Court of Human Rights ruled Nov 3 that placing the crucifix in classrooms infringed parents’ right to educate their children “in conformity with their convictions”. The court ruling has sparked fierce debate in overwhelmingly Catholic Italy where the Vatican earlier this month strongly rejected the ruling, saying it was “wrong and myopic” to exclude a symbol of charity from education. The case was launched by an Italian woman, Soile Lautsi, who opposed the display of a Catholic crucifix at her children’s state school in Abano Terme, a small town outside the northern city of Padua. Lautsi was also awarded 5,000 euros in damages by the court.